Use Your "Back Button" to Return to Product Page! Magnets are commonly used for temporary mounting of Accelerometers while collecting vibration data for balancing and analysis. 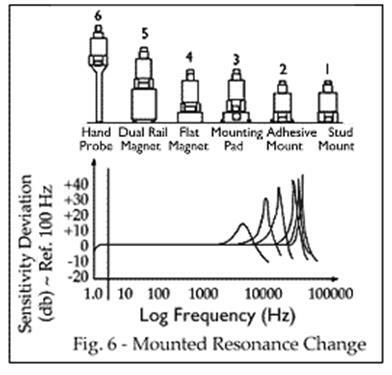 In general magnets are not used for permanent mounting of Accelerometers as they can be dislodged by both contact and vibration. Rare earth magnets such as those made from Neodymium have much more holding power than those made from Alnico or Ferrite and have become more price competitive since the 1990's. Flat Magnets should only be used on prepared “Flat” surfaces. 2-Pole Magnets should be used on rounded surfaces such as bearing Caps. 2-Pole Magnets can also be used on flat surfaces. Magnetic mounting lowers the resonance frequency for the Accelerometer. Verify that the Magnet mounting stud or thread matches your Accelerometer mounting. Diameter should be considered based on available mounting area.